I’m sure that many of the activists in neighboring Arivaca (of Pima County, Arizona) can identify to some extent with this article and my experiences. I am very proud to live in Santa Cruz County—a county that has a good number of activists for a variety of worthy causes. And I want to honor Mayor Garino of Nogales, Arizona for his valiant stance for prayer before the council meetings—a nationwide issue that went all the way to The Supreme Court. It takes both courage and humility for the Mayor to stand up for the right of city officials to pray for some assistance higher than just themselves in meeting the many challenges of local governments. Even more ideal is when the various belief systems of the local area can be represented in these prayers. No one has to personally participate in the prayer who chooses not to, but I think providing the opportunity for those who want to appeal to a Higher Source is wise, for many reasons. I enjoy living in Santa Cruz County because I appreciate the family-oriented Hispanic people who live on both sides of the U.S.-Mexico border in this region and who are especially impacted by many political, economic, and environmental policies and practices that are currently being implemented in this country. It makes me a better activist, wanting to help defend their human rights and address environmental issues that affect the quality of their lives. I first became an activist at 24 years old, when, as an employee of a steel company in Pittsburgh, Pennsylvania, I was sent by the Steelworkers Union to meet the then-campaigning and soon-to-be Governor Shapp. I found out right away that outside of my local neighborhood, there were actually people who didn’t like the fact that I went to support Governor Shapp as a representative of the union. I didn’t lose any friends in the immediate poor neighborhood where I lived, but I did lose so-called friends in the suburbs. My father was a union representative for Jones and Laughlin Steel, and I used to hear him rant and rave about those other, wealthier folks who had issues with the unions. “Management” offered him positions for many years, but he always turned them down because he said he wanted to work for the people in “labor.” His influence guided my life. We at Global Community Communications Alliance have been active in various border issues, such as being advocates against a check-point here in Tubac, Arizona, and the taking down of the wall on the U.S./Mexico border in Nogales, Arizona. We have hosted many speakers presenting these issues. I remember myself 40 years ago, when I used to go to several prisons in Mexico as a chaplain, crossing the border, along with thousands of others on a daily basis, who shopped in Nogales, Sonora. It was a very busy and cross-cultural environment then. I had friends on both sides of the border, and there was ease of travel across the border. I hate it when the check-point Border Patrol ask me am I an American citizen. I’m ashamed to say yes, so I say “Good morning” or “Good afternoon” so they can hear my “American” voice. I feel like I’m a citizen of the world and that there should be no more borders anywhere. And I have written many articles about this subject. Many years after my father was a union representative in Pittsburgh, a friend in Sedona once said to me, “If you’re going to fight against a major bridge going in over Red Rock Crossing, are you willing to go all the way?” I soon discovered what he meant. Within a very short time after joining forces with others who asked me to assist them, I became a spokesperson for several groups who united to fight against the plan to build a large bridge over Oak Creek in the Sedona area, which would then open the way for more development (and ensuing traffic) in a lightly-populated region that was not intrusive of the pristine surrounding Forest Service land. One of the main proponents for that project was the publisher of Sedona’s Red Rock News, and soon the Red Rock News began a smear campaign against me and those in the spiritually-based intentional community I co-founded. Gabriel of Sedona became front-page headlines for three weeks, and they used disgruntled apostates for their interviews and “facts.” You can hardly imagine the lengths they went to in order to discredit me. I think they, as well as some other newspapers in this state and around the country, are still involved to this day in trying to malign me, and those closely associated with me, since I have become a nationally-known activist in social and religious areas on a worldwide scale. There is an overall general network (with offshoot “specialized” smaller networks) that include individuals and groups of certain political, economic, and religious ideologies who are united with many newspapers and radio and television stations that use the strategy of discrediting any individual or group of activists who do not agree with their political, religious, and economic agendas. And of course, most mainstream status-quo media of newspapers, radio, and television love development—more houses means more people, which means more advertising and more customers. For many years I and the members of Global Community Communications Alliance have experienced publicity that involves yellow journalism filled with misrepresentation and falsehood. The same small group of disgruntled ex-community members (apostates), bitter ex-spouses, fearful noncommunity family members, and so on are often quoted to support the premise that we are a “cult,” which has many negative connotations that stir up fear, misunderstanding, disrespect, ridicule, and even hatred towards the members of the community, and especially me. As is so often the case with people united for a common purpose, some members who leave a church or a group they were once part of call that group or church a cult, while joining another group or church around the corner. This is how it has been throughout history with apostates. The term apostasy is taken from a Greek term that means revolt, with the definition of an apostate being: one who defects from a previous loyalty, whether it be philosophical, political, social, or religious. In relation to religion, apostate is also considered to be a derivative of apostle, of which the true meaning is: one who walks with God in the highest manner and follows His will. In this context, apostates are defined as those who have renounced their commitment to a faith and/or spiritual group. Thus apostates are the opposite of an apostle, though they often claim to still be walking in God’s will. Hmmm…figure that one out! This collective network work closely with each other to discredit, misrepresent, and demonize true activists, if an activist’s (or activist group’s) voice becomes powerful enough to attract their attention. The religionist Jesus was an activist, and the 1% of His day feared and hated Him because His spiritual teachings contradicted some of that generation’s accepted religious, political, and social ideologies that caused human suffering and injustice. In Sedona we started our first organic garden, with seven acres of organic topsoil, cultivated for about 15 years, and grew organic vegetables and fruit trees, and created a flourishing garden in desert and rock. We began learning and practicing sustainability and permaculture. When we moved to Tumacácori, Arizona and got more and more into green building, we became, then, an EcoVillage, and the land that Global Community Communications Alliance is on is called Avalon Organic Gardens & EcoVillage. I teach that sustainability is first a consciousness. I wrote a book called Who’s Afraid Of The Big Bad Wolf? How to Defeat The 1% By Building Communities and teach not to buy the products of corporate America. I believe we need to get back to family values and urban gardens. And mostly, we as a nation need to begin our own manufacturing again, producing sustainable products and stop buying the sometimes poisonous products from China. The small farm in America has almost disappeared. People do have to learn to buy locally and support their local farmers and protect their children’s health from toxic food, shipped sometimes thousands of miles to their tables. I founded a restaurant called Food For Ascension Café in Tucson, Arizona, in which sometimes the food is harvested and put into a delicious meal within two hours. We purchase from other local farms. We have many educational programs and work on food health and workshops and seminars on growing organic food. Global Community Communications Alliance has representatives who belong to the Friends of the Santa Cruz River (FOSCR) and write many articles on water issues. Not only our oceans are being destroyed, but many of our fresh-water sources are also now destroyed by mining and fracking. Just about all fresh-water sources in this country have been contaminated in some way, and only in areas that have mountain springs and snow melt are not contaminated. The 1% are buying up all of the water rights around the world, which is another way of controlling the people. China is actually buying billions of gallons of water from the United States government from the Great Lakes. You do not hear this on your local news. Many countries of the former Soviet Union are warring with each other now over fresh water. Millions of people die for lack of water in Africa. Much of the water is contaminated, thanks to American oil companies. The same thing is happening in the Amazon with the lumber industry and other mineral-mining companies. All of this destroys not only the lakes and rivers, but also the underground aquifers—all in the name of profit. Those benevolent organizations that fight against these corporate atrocities are also misrepresented by the media and attacked by government authorities at all levels, who have sold out—not that all government officials are in cahoots with corporations, but many are. I have taught for years that the Third World War could very easily be started over water issues. In the Middle East, Israel has made sure they control most water rights in the Jordan River and other water sources. There are other attempts by corporations to actually take over your private wells and make you pay for your own well water. And this is happening right here in Arizona. My name for the last ten years—Gabriel of Urantia— represents a new paradigm in spiritual concepts, of which I am a teacher. My work (The Cosmic Family volumes) also deals with the continuation of The URANTIA Book, so I am a pioneer in the spiritual arena as well, rocking the boat of many more-fundamental religionists. Martin Luther certainly had his problems when he posted his 95 Theses on the door of Wittenberg Church. He is known as “God’s volcano,” and his revolutionary teachings certainly brought a fire to all of Europe, starting what has become known as The Reformation. Many reformists before and after him also caused many spiritual renaissances by teaching spiritual concepts that they believed they were hearing directly from God. Some of these men were John Calvin, John Wesley, Francis of Assisi, St. Augustine, and many more. If all these reformers’ teachings are right or wrong, it does not change the fact that they made a dent in church history—Protestant and Catholic. In another local situation in Sedona, a group of local people and I went against a major developer and, after many months of organized “battle,” we were actually successful in stopping him and his company’s shareholders from building a complex of a few hundred homes that would have encroached upon the quality of Oak Creek’s pure spring water as well as destroying much of the greenbelt of riparian trees, which they already had started cutting down, dumping unnecessary waste into the creek in the process. On their side, the individuals, who had interest and stock in this project, joined the network (referred to earlier) in attempting to stop all of us by minimizing our concerns, even ridiculing some of them, as well as maligning some of the individuals and organizations involved. This collective network includes certain corporate powers that are threatened by any group that encourages minimal consumerism, which I and my intentional-community associates advocate and practice in our model of sustainable EcoVillage living that includes: shopping at thrift stores and fair-trade companies (rather than Wal-Mart and co.), sharing many of our possessions, growing most of our own food, carpooling, and living in many other sustainable ways that promote wise use of our natural resources. This kind of living really pisses off corporate America and the 1%. 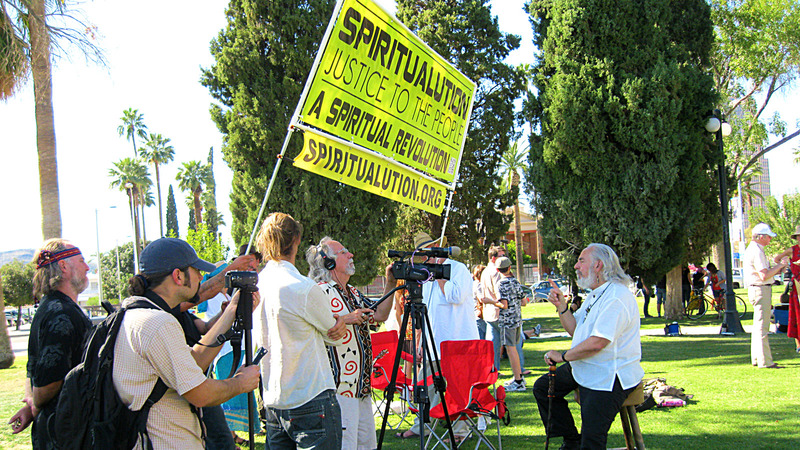 About 16 years ago, the status-quo television media came after me and my community big time, under the disguise of wanting to do a story on the community and me about alternative spiritual groups. They shot many aspects of the community for three days, including short interviews with several community members. And they even interviewed the other founder and me for 3 ½ hours. When we saw the final one-hour show (minus commercial time), we could not believe what had been left out and how they had cut and edited, presenting bits and pieces that did not represent the truth of what I or the rest of the individuals in the community were about. Obviously there was nothing in their audio and visual footage of us that they could use to present their intended negative slant, since the show had only about 5 minutes of clipped quotes from 65 hours of their footage. In that show, there was also nothing to give a positive and truthful impression of us, nor was there anything of the interview with me that reflected what I had really tried to communicate, even showing me giving answers to other questions with their cut-and-paste techniques, which made my answers look ridiculous. I cannot begin to share with you the effect and the damage that show had to my life, the lives of my family, and the lives of all the 100+ community members and their families. Individuals came up to me in public at restaurants and threatened my life and wanted to start fights, sometimes in front of my children (who were at that time 12 years old and younger). My life was threatened numerous times by email. And every time a newspaper writes a negative slant, using the “cult” card, the death threats continue. And we still have to live with periodic misrepresentative coverage from newspapers, like an article recently published in the Green Valley News by Bill Francine and supported by his editor, Dan Shearer. About five years ago and again just recently The Arizona Republic published an article of similar negative slant. These journalists feed off of what has already been put “out there” and build their stories upon the foundations of falsehoods already in the public domain. Every time an article comes out that presents an untruthful picture of who I and the individuals of this spiritually-oriented community are, we have to deal with the backlash, which is usually the intended result of the one who wrote it and often the publisher. As a young minister in my early thirties on 4th Avenue in Tucson, I started a homeless ministry. I was also a volunteer chaplain for the Pima County Sherriff’s Department and worked in many other prison ministries, including in Mexico. Working with the homeless and the poor is not a very respected ministry, like it would be if you were a pastor of a church. I received a lot of resistance from certain church-going people as well as a few neighbors for my ministry there in that area where there were already many people struggling to exist and stay in their modest homes. Trying to help the poor and disenfranchised is not popular, even with the middle class. So when I and others helped a woman in Sedona continue her home childcare services for poor families in a middle-class neighborhood by supporting her attempts to get licensed with the city, some neighbors protested. I received letters from “upstanding citizens” telling me to back off. I also had in that neighborhood a transition home that housed some hard-working individuals who had been homeless but no longer were. Of course I received many letters from other “upstanding citizens” to keep my homeless ministry out of their neighborhood, though these people now lived in a clean, orderly home and lived quiet peaceful lives. This is one of the reasons why the homeless have to live on the streets, for those who would like to provide a living situation for them run up against strong resistance from the not-in-my-back-yard proponents. I think it is criminal when any media source decides to put a particular slant on an individual or group of people, no matter what evidence is discovered that would change that slant into a more balanced and fair perspective. What I and my community-member associates have mostly experienced with the status-quo media, that is tied into the more mainstream mentality that supports the existing corporate-led policies and practices, is that the actual good we are doing in the many ministries that I have co-founded—like the Personality Integration Rehabilitation Program for teens, young adults, and even not so young adults—are either ignored, minimized, or even discredited. My personal ministry and humanitarian background (which is online http://gccalliance.org/resume/ ) and work with the homeless for more than forty years is not really considered because the purpose of these types of media coverage is to leave a negative and discrediting impression, and they even resort to slander to get their point across. Because we in the community have been in existence for more than twenty-five years and have proven who we are by the fruits of our labor, we do now have more truthful representation from alternative media sources who are not plugged into the network of status-quo values and solutions. Unfortunately, there are some individuals—who get angry with me or another community member for some reason, or has a personal vendetta—that join this well-oiled network that uses these individuals as puppets to do all kinds of crazy things—like calling governmental officials and stating all kinds of lies about me and the beautiful people and religious order workers who are here at Avalon Organic Gardens & EcoVillage. This network even had the audacity to come against a concert of mine in Colorado, by contacting the music director of The Durango Herald with their lies so that we got minimal press from the one major newspaper in town and boycotting methods were used, even trying to stop any pre-concert radio interviews. The resulting low turnout for the concert was devastating to my band and me, so much so, that I have not been on tour since. Niánn Emerson Chase and I co-founded Global Family Legal Services nonprofit program in 2004 in Sedona, Arizona, which works with lower-income individuals and families with immigration and domestic cases. We have helped people from all over the world. Very seldom do the ones we help join our community, but there was one young man—who walked all the way from Guatemala!—who ended up in a detention facility in Phoenix and was about to be deported back, when we heard about his plight, and we were able to transfer him to our community, where he has been with us now for several years. He is a very hard worker, and speaks three languages, and is one of the nicest human beings you could ever meet. It’s hard to believe that many take offense to helping people from Mexico or South America, and the whole issue of legal immigration is still a very sour topic to many Americans. We are blessed with having Celinas Ruth, Esquire, to be the head attorney of Global Family Legal Services, and she has been an activist for many years—not just in immigration but in other social areas. In 1985, when I brought the first New Age Vocal album, Unicorn Love, to Hollywood, Windham Hill (the first New Age music label) told me, “There’s no such thing as New Age Vocal”. Now they have many vocal artists on their New Age label, but I went far beyond New Age Vocal with CosmoPop®, which is commercial-sounding in many respects. My new genre CosmoPop® has many definitions, but basically it is higher-consciousness lyrics, often invoking God as the answer to life’s problems. The songs often have mantras. And even though it’s spiritually-hip vocal music, because it doesn’t sound like traditional Christian contemporary music or gospel, Christians are not “supposed” to like it. So the true music pioneer suffers in the arena of the music industry also, although I have started what is called “conscious pop” across the United States and world. Included in this collective network, which I spoke of above, are the professional “cult busters” who make their living off of identifying hundreds of groups as “cults,” many of those groups being in existence for decades and in higher service to humanity. One so-called “expert” is Rick Ross. If you look online and do some research, you can see that he is the real criminal, with a record of several offenses. Ross found out that getting into the cult-buster business is good money, and so he considers anything alternative a cult, including Alcoholics Anonymous! Father Daniel Berrigan and his brother Philip were Catholic priests who were true activists and paid the price, as did so many others like Father Oscar Romero of San Salvador. These great souls also had followers and associates who suffered by the hands of those less-scrupulous. All throughout history, true harbingers of change have been persecuted in some manner by the status quo, including Francis of Assisi. He wasn’t loved so much by the rich because he walked away from the wealth of his parents and served the poor, and the rich of Europe did not like him for his example. Symbolically speaking, the Way of the Cross is not felt unless you’re willing to pick up the cross (the burden of loving service) and carry it, taking it to the top, willing to be crucified like our Lord. So when my friend asked me that question those many years ago in Sedona, “Are you willing to go all the way?”, my answer then and has always been, “Yes.” But I realize that others may not have that fortitude. However, if they can take just little steps forward in their activism, and do something, evil would be lessened in every area of life. Unfortunately there is much corruption in government and other institutions of our country, even in areas like education, health care, social care, and religion. All too often the abuse of women and children is allowed where it could be stopped. All too often children are malnourished and neglected. Human trafficking is rampant, as is alcohol and drug abuse in our high schools and colleges. Too many of our youth, including college students, suffer from being spoiled and are brought up in affluence (the “haves”). Others who have grown up in poverty (the “have nots”) suffer from a sense of disenfranchisment. Both groups suffer the disease of materialism that results in boredom, apathy, restlessness, anger, and a lack of respect for others. If you ever drive down 4th Avenue in Tucson on a Friday or Saturday night, you will see both the “haves” and the “have nots”, college students and nonstudents, wandering the street in search of something to fill their hunger for “more.” It makes you wonder if sending your sons and daughters to college is the answer for their success and ultimate happiness. So where do we go from here? I think that all activists need friends and supporters. Citizens who do not consider themselves activists but realize they benefit from individuals who are willing to put themselves on the front line should defend those “front-liners”—those who protest on the streets, who write articles and books and make films about the many social and environmental problems. You yourself don’t have to stand on a soap box or picket. All you need to do is open your mouth to your friends around the dinner table or over a cup of coffee, supporting those who do the picketing and soap boxing. And if you really want to help, write a letter to your local editor, supporting those activists.